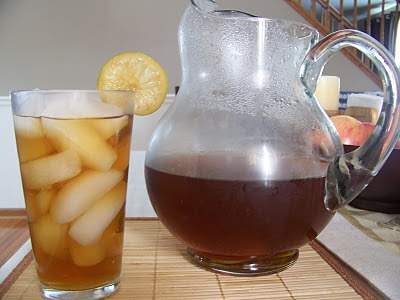 I made us some unbelievably refreshing Lime Sweet Tea and I thought of sharing it with you. Normally, people go for lemon but I only had lime and just adore how refreshing and fragrant it is so I went for it! This is my own recipe so go ahead and play around with it to suit your taste. 1. Make the simple syrup by combining 1c of sugar and 1c of water in a small pot. Stir / whisk well and bring to a rolling boil. Make sure that the crystals dissolve. When everything is dissolved, you can turn off your heat. 2. Zest your lime on the simple syrup mixture. You can zest an entire one or just a half of a lime, depending on how strong you want the lime flavor to be. Stir a little and set aside to cool. 3. In a bigger pot, boil 8c of water. 4. Once your water boils, place your teabags in and turn off the heat. Let your tea steep. I let mine steep for about 2-3minutes. Again this depends on how strong you want your tea, although I heard steeping for too long may also cause a bitter taste. 5. Pull out your tea bags and let your tea mixture cool for a bit. 6. When cooled, pour your tea into a pitcher and mix in your lime-flavored simple syrup. If you don't want your tea too sweet, do not use the entire simple syrup mixture. 7. Slice up the same lime that you zested and drop them into your pitcher. Pour some into an ice-filled glass and ENJOY!